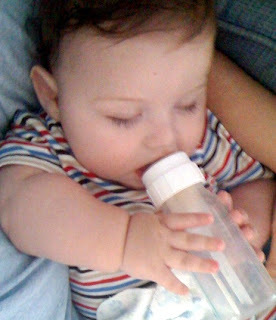 Mom sent me this quick pick of Luke holding his bottle. It looks like he is or has fallen asleep while doing it. He has been extra hungry today having already eaten 3 bottles by noon when usually he only has 5 bottles all day. He has been sleeping a lot lately too. Perhaps his body has just finished or is just starting a growth spurt.